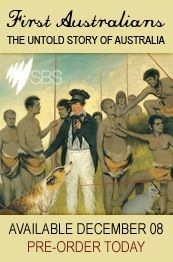 … they could have no doubts or reservations left after seeing tonight’s episode of The First Australians. I have mentioned this wonderful show twice before: here and here. Tonight we had stories from people still living who went through the trauma of forced separation, including Sue Gordon, who, you may recall, was close to the Howard government. Tonight we were also told that a book of the series is to be published on the 1 November, and that the DVD will be available from Marcom very soon. Galarrwuy Yunupingu is an Indigenous leader of great stature. I have referred to him several times before. In today’s Sydney Morning Herald he argues that not all was bad, comparatively, in the days the Christian Missions were more involved in Aboriginal communities. Some will find that challenging, but he may well be right. I think it is very important not to rule certain things in or out on purely ideological grounds, a position that you will have noticed I have been developing here over the past year — especially since the Northern Territory Intervention. I do believe that Intervention was tainted by the previous government’s excessive reactivity to so-called political correctness, and also by excessive paternalism and unwillingness really to consult. Nonetheless, the Howard government was, after shameful neglect for a decade, confronting some real issues and not everything they did in response was bad. That is what the Rudd government has clearly been considering, not pleasing everyone in so doing. On Australia Talks (ABC Radio National) last Monday was a very interesting discussion of some of these matters. At the moment you may also listen to the program or download it as a podcast.